I am Pastor Obed Byringiro, 29, married with 2 children namely: King Bright and Queen Brigetty. I am a minister working in Rwanda, Africa. I received my B.S. 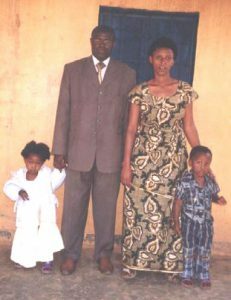 theology degree last September 2006 at Adventist University of Central Africa, supported by Hal Ruppert of Oklahoma. 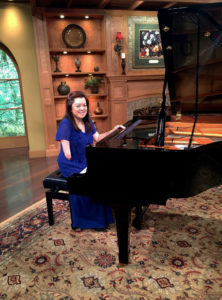 I was born in an Adventist home. My parents, brothers and sisters are Adventists. Since I was a child I’ve always wanted to become a pastor. I have been working under Rwanda North Association during the past 2 years. 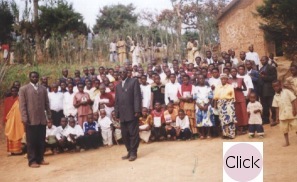 There are 426,000 church members in Rwanda North Association and in my district, there are 1,741 church members. Everyday I do home visitations and give Bible studies. I travel around my assigned territory in a bicycle given to me by my sponsor, Hal Ruppert. Last July 2008, I gave a crusade and around 2,000 people attended it. Many came from as far as 28 kilometers (17 miles) using their feet to come to the church where I held the crusade. Many young people who came needed food because they no longer have parents because of the genocide of 1994. Rwanda is a poor country where people dig in the field to find food. We have peace in Rwanda now and people are free to go to church, or to crusades. In Rwanda, people love Jesus and are very receptive to hear about Him. About my district, I have 14 churches with 3 colleges as my assigned territory. I have 1,741 church members in all 14 churches. Adventist baptism in Rwanda From my first church to my last church, I go the day before Sabbath so that I can lead the Sabbath program. I ride my bicycle and also walk part of the way of the 50 kilometers (31 miles) to go to the churches under my district. There are other ministers like me who need financial support. Please help us. I would like very much to have evangelism materials such as: a projector and a laptop. I wish I could send you more pictures but I do not have a camera. A friend took the baptism pictures. I thank God for Adopt a Minister International and I’m praying that He will bless it so many more like me can harvest souls for Jesus. Rwanda is a very hilly country, with steep slopes ravaged by massive and devastating soil erosion, which is exacerbated by over stripping of land, deforestation, and inadequate use of land improvement techniques. 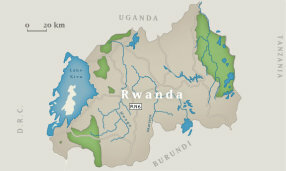 Rwanda is situated east of Central Africa. Rwanda’s economy is based mainly on Agriculture. The country’s exports are principally coffee and tea. Land resource is, therefore, the most important factor of production and survival for the nation and the entire population, and it will remain the backbone of the national economy for a long time to come. Official languages: English, French and Kinyarwanda. Kiswahili is also used in commercial hubs. Principal religions: The nation is some 56.5% Roman Catholic, 26% Protestant, 11.1% Adventist, and 4.6% Muslim, original beliefs 0.1%, none 1.7% (2001). 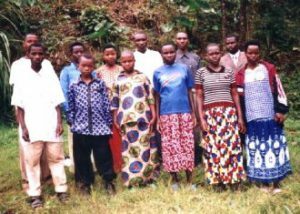 There are over one million Seventh-Day Adventists in Rwanda. Pre-colonial Rwanda was a highly centralized Kingdom presided over by Tutsi kings who hailed from one ruling clan. The king ruled throughout three categories of chiefs: cattle chiefs; land chiefs; and military chiefs. The chiefs were predominantly, but not exclusively, Batutsi, especially the cattle and military chiefs. In 1899 Rwanda became a German colony. After the defeat of the Germans during WW1, subsequently in 1919, Rwanda became a mandate territory of the League of Nations under the administration of Belgium. The Germans and the Belgians administered Rwanda through a system of indirect rule. In 1935 the Belgian colonial administration introduced a discriminatory national identification on the basis of ethnicity. Banyarwanda who possessed ten or more cows were registered as Batutsi, whereas those with less were registered as Bahutu. When the demand for independence began, mainly by a political party – Union Nationale Rwandaise (UNAR) – formed by people from the aforementioned ruling elite of the Batutsi, the Belgian authorities hastily nurtured another party called PARMEHUTU that was founded on a sectarian ethnic ideology. Under the Belgian supervision, the first massacres of Batutsi at the hands of the PARMEHUTU occurred in 1959. With Belgian connivance, PARMEHUTU abolished the monarchy amidst widespread violence. On July 1st, 1962 Belgium granted formal political independence to Rwanda. The first massacres in Rwanda took place in 1959 with the population of Batutsi targeted. 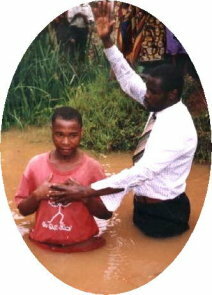 Thereafter, almost in a regular manner, Adventist Mission Work in Rwanda.killings of the Batutsi became a habit. In the 1960s, 1970s, 1980s and early 1990s massacres of Batutsi were common. Between April and July 1994, over 1 million Rwandese people, mainly Batutsi and some Bahutu opposition were killed by the genocidal regime in a deliberate effort of ethnic cleansing. So many people were involved in the killings. Those who planned and organized the genocide included the late President, Major General Juvenal Habyarimana, top government officials, members of the so-called Provisional Government, the presidential Guard, the National Gendarmerie of the Rwanda.